Handley Library is the scene of the very first murder in Mount Hideaway! 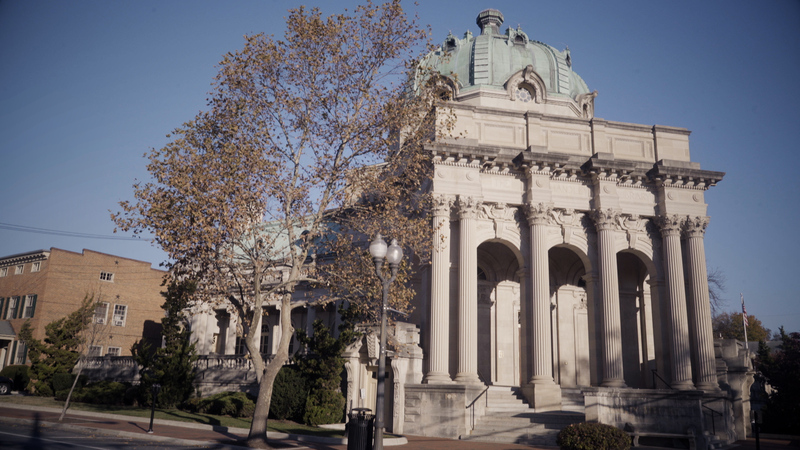 We were honored to be able to film in this beautiful historic building. Handley Library is a historic library building located at 100 West Piccadilly Street in Winchester, Virginia, United States. Completed in 1913, It is listed on the National Register of Historic Places (NRHP) and Virginia Landmarks Register. In his will, Judge John Handley (1835–1895) left $250,000 for the city to erect a library “for the free use of the people of the city of Winchester” and schools for the poor. Construction of the library, began in 1908. The library opened on August 21, 1913, and originally featured a 300-seat lecture hall, study rooms and conference areas. It continues to serve the area with a combination of historic beauty and modern technology.